The first thing that strikes you about Hrithik’s character is that he is a controlled person. He can be quite disciplined with himself, and while a part of the reason is that he has the willpower, it is also a great deal to do with his temperament. He is focused on his goal, is not lazy, and is consistent. He is patient, not expecting results overnight. 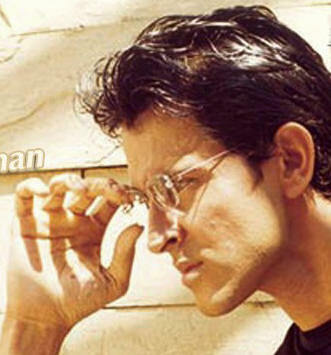 Hrithik is right-handed and it is the right hand which was read to reveal his current state of mind. As he has a double thumb on his right hand (a birth defect), his left thumb was read. Birth defects or malformations of the hands and fingers due to accidents or the genes are not a palmistry indication. More than his fair share of good qualities? generous, loyal, helpful, liberal, broadminded, sensible and compassionate nature. 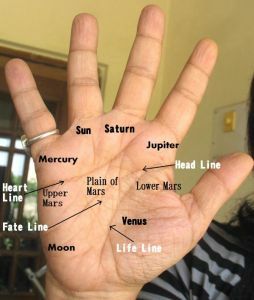 This is confirmed by other signs like that of the size of the hand, the wide quadrangle, width of his hand, his headline and well-balanced fingers. Check out his hand photos here and here. 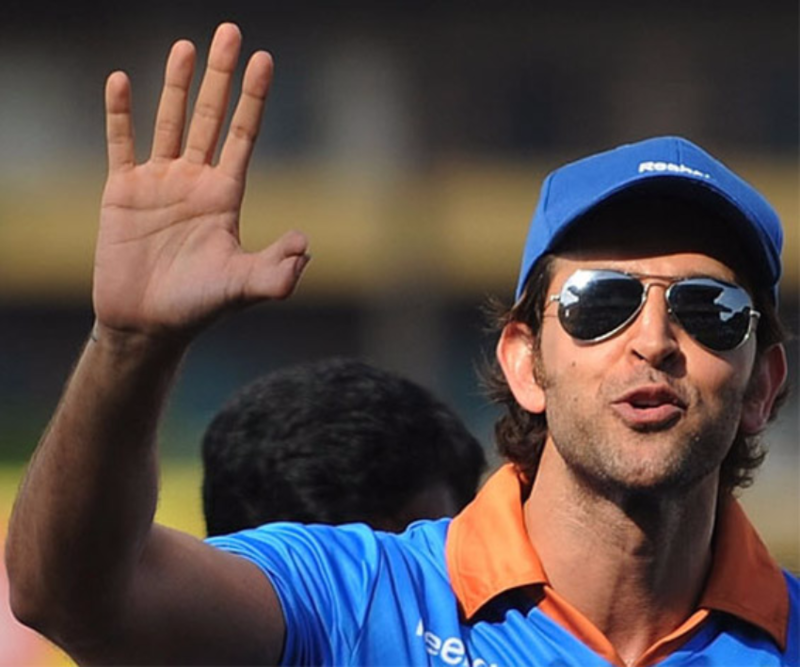 Hrithik Roshan has long fingers and a broad palm, and this is called the Thinking Type of hand. He also has long first and second phalanges, and his fingers are well balanced with each other in terms of length, and the Mercury (little finger) is quite long, longer than average. He has a long and well-balanced headline, and the heartline is well etched too. The Moon and Venus mounts are well developed. All these hand features show that Hrithik Roshan is a thoughtful person, and suited to a mental and creative occupation. He is a thinker, imaginative (although sometimes his imagination can run away with him) and talented. He is an original thinker, a planner, and planning and communication would be an important part of whatever he does. Plus, he is organised with great self-control. Focus is also present. All these personality characteristics would help him succeed, and not just in acting. Possibly film direction and production too. He has a tendency to go into the details and this exacting nature would ensure that no detail escapes him. He is the kind who can go to great lengths to get something right. And he can get along with people. He is shrewd and clever and quick, even if moody. Hrithik Roshan's hand is also fairly large, long and he has sensitive pads on the tips of his fingers. There is the fine thumb, the tapering fingers, and the waisted second phalange of the thumb. His thumb is conic. Hrithik's hand clearly shows that by nature, he is diplomatic and dignified, and will not roughshod over other people’s views. This actor would be quite sensitive to his surroundings as well as to other peoples' feelings. At the same time, his head is in control at all times. And he is also very straightforward. So all in all, a good balance. He is guided by his head and can behave in a headstrong manner. However, his sensitive nature can keep these weaknesses in balance. He is a little too impressionable, liable to be influenced or carried away. He can be idealistic too. However, the flip side is that this same quality can add to his creative ability. Hrithik is basically a freedom loving person. He does not like his creativity to be hemmed in, nor does he like anyone interfering in his life. However, he is not a hypocrite and will uphold these same standards. Hrithik lives more in the mental and creative world, with a curious and inquiring mind, and money does not matter that much to him. Luxury is something he can do without. Rich food and drink will not excite him. 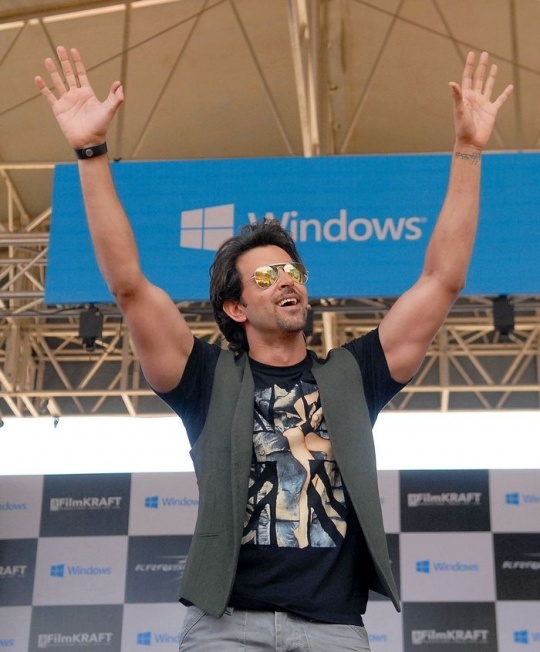 Overall, Hrithik Roshan's hands show that he is a good man, although he has to keep in check the impressionability. Or read about the popular Telugu actor Prabhas Raju Uppalapati or the Kannada legend Rajnikanth. Here is a comparison of Bollywood actors Kareena, Katrina, Priyanka and Aishwarya! I think Jodha Akbar was one of his best performances..and in that movie many of traits you have mentioned, came out.. I am not much aware of behind the scenes activity but yes Hrithik was very good in that movie. So was Aishwarya in fact. Hrithik Roshan's hand can be compared with actor MGR AS LOWER SPATULATE with more width on the palm at the thumb portion increasing the inspiration of acting.The bottom thumb bone is typical thus expanding the span.With the sloping head line or brain line every artistic instinct gives an inspiring acting. Rydberg genes responsible for cancerous growth spatula formation. wavelengths of light associated with transitions in atomic hydrogen. energy levels converging on a finite limit. quantizing transformation optics in oblique neutron phase plane . Sankaravelayudhan Nandakumar,Oxford astro geneticist and palmist.